Normandy has a lot to offer visitors of all kinds but it is paradise for military history enthusiasts in particular. Numerous people come primarily to pay their respects to the Allied dead and tour the battlefields of World War II. The city of Bayeaux, an ancient Viking settlement, retains its old-world atmosphere with wooden and stone buildings and cobbled streets. The surrounding area is strewn with interesting military history sites, including the famous D-Day landing beaches. In Bayeaux visitors will also find the magnificent Tapisserie de Bayeux which tells the story of the famous Battle of Hastings. To chart the history of two iconic military heroes visit the capital of Rouen, where William the Conqueror died and Joan of Arc was burned at the stake. The heart of Richard the Lion-Heart is entombed in the Chapelle de la Vierge as a token of his love for this city. The region has its share of peaceful little towns and beautiful scenery. One of the most popular villages is the picturesque old fishing town of Honfleur, which served as inspiration for some of the famous Impressionist painters. 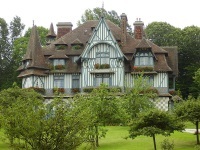 One of them was Monet and his house and garden in quaint Giverny can be explored. Presiding over the region is the magnificent island monastery of Mont St-Michel. Huge tidal variations mean the island is at times cut off completely by the sea. When the tide retreats, Mont St-Michel is surrounded by a desert of glistening wet sand. We are looking for contributors for our Normandy travel guide. If you are a local, a regular traveller to Normandy or a travel professional with time to contribute and answer occasional forum questions, please contact us.